She is a woman divided. Her past, present, and future are as twisted as the lies she's lived for the past eight years. Desperate to get the truth, she must turn to the one man who may also be her greatest enemy. Can a woman plagued by mystery fall in love with the man who refuses to face the truth? And can a man drenched in darkness forgo his quest for vengeance - and finally find redemption? 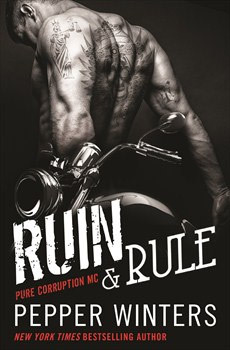 Ruin & Rule is the darkly addictive, decadent first novel in New York Times bestselling author Pepper Winters' Pure Corruption MC series where friendship means family and feelings never die. Pepper Winters is a New York Times and USA Today international bestselling author. She loves dark romance and star-crossed lovers, as well as the forbidden and taboo. She strives to write a story that makes readers crave what they shouldn't and delivers complex plots and unforgettable characters that keep readers talking long after the last page is turned. On a personal note, she loves to travel, has an addiction to creme brulee, and is married to an incredible Canadian who puts up with her endless work hours and accompanies her on signings. She's also a firm believer that the impossible can become possible. For all the latest news from Pepper, visit pepperwinters.com, follow her on Twitter or join the thousands of readers who have become Pepper's friend on Facebook and Pinterest.